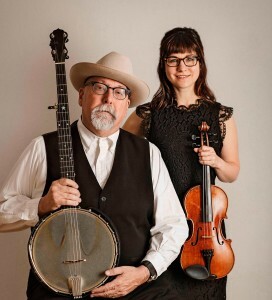 Joe Newberry & April Verch are both outstanding musicians, and their American/Canadian duo collaboration is fuelled by a shared passion for traditional music, blending folk, bluegrass and old time Americana. With joyful fiddle tunes, poignant original and traditional songs and April’s spectacular step dancing, Newberry and Verch’s hugely entertaining live show appeals to a wide range of music lovers. They impressed every promoter and audience on their short 2018 tour and we’re looking forward to bringing them back in January/February 2020! Born in Missouri and a longtime resident of North Carolina, Joe Newberry is a top notch banjoist, guitarist, singer and songwriter, a charismatic performer who charms audiences wherever he goes. He was a guest star on 2016’s popular Transatlantic Sessions live tour and his award-winning songs have been recorded by artists including Ricky Skaggs and the Gibson Brothers. Joe’s other projects include his duo with mandolin legend Mike Compton. April Verch is a world class fiddle player, step dancer and singer from Canada’s Ottawa Valley, who started step dancing at age three and playing the fiddle at age six! April has countless awards, ten albums and sixteen years of touring around the world under her belt with her own trio the April Verch Band. These two hugely talented musicians came together several years ago for this very special duo project, and now tour regularly across the world. The collaboration is a seamless blend of Canadian and Ozark/Appalachian styles, a masterful fusion of shared interests and musical tastes. Their voices blend in harmony, their instrumental playing is unsurpassed, and the addition of April’s spectacular step dancing takes their live performances to another level! They released their first album Going Home in 2017. Joe and April brought their sparkling talents to the UK for a one-week tour in April 2018, and we’re looking forward to bringing them back in early 2020 – contact us for availability!